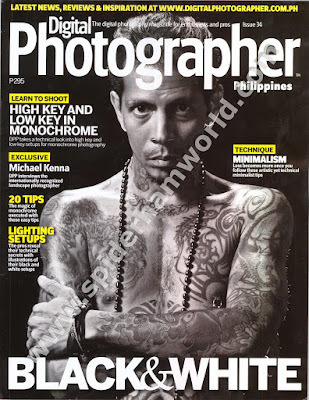 Digital Photographer Philippines (DPP) goes 'black and white' with their new issue. DPP Number 34 discusses a lot of simple tips from experts on how to achieve a get a good black and white image. This issue also tackles ideal setups for monochrome photography and recommended techniques for minimalism. This issue shows an exclusive interview with Michael Kenna, an internationally recognized landscape photographer. Digital Photographer Philippines is now available at your magazine stands and leading book stores. good magazine for photo enthusiast.